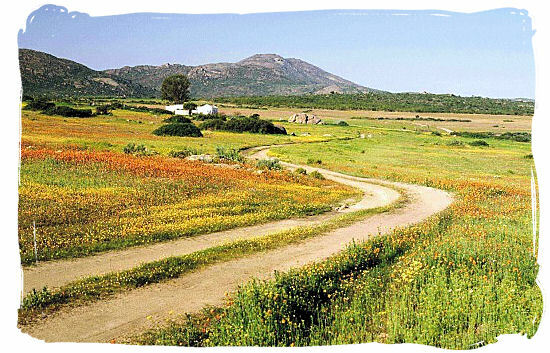 To enable you to get close to the Namaqualand flowers spectacle, the park offers circular driving routes with great viewpoints from where you can soak up the spring flowering display. There are also several short nature trails that will take you into a kaleidoscope of coloured flowers. You can take a rest at the picnic sites that are provided, to come to grips with all the overwhelming experiences and impressions. Through the more extensive Namaqua region you will find quite a number of delightful routes that you can travel to further explore this land of extremes. Old Copper Way came into being during the1600s and traces the route of Simon van der Stel, Dutch governor of the Cape Colony at the time, as he journeyed in this region in search of copper. Following this historic route is going to take you back in the historical past as you are travelling past old mining settlements and towns. Those that are looking for a little rough and tough might well enjoy Namaqualand by way of backpacking or mountain biking through the Kammies Mountain. Choices and options are plenty. 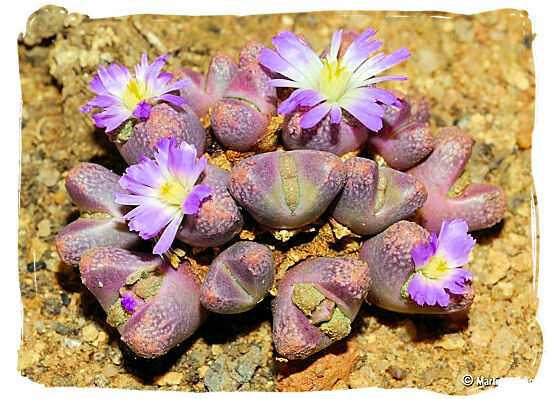 There are a number of things that you ought to take into account when visiting Namaqualand. Usually the flowers will only open up in sunlit weather conditions, which means that the most suitable timeframe of the day to view the flowers is going to be between 11:00 and 15:00. Take your time when driving and make frequent stops to allow it all to sink in so you can make the most of the flower spectacle. 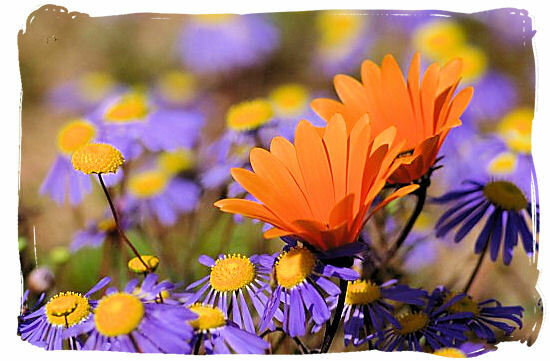 There are plenty of Namaqualand daisies that are totally different in colour, you most likely would not want to miss any. Local people are certainly warm and friendly and are happy to guide you with directions, not to mention helping you with tips on finding the best flower areas. 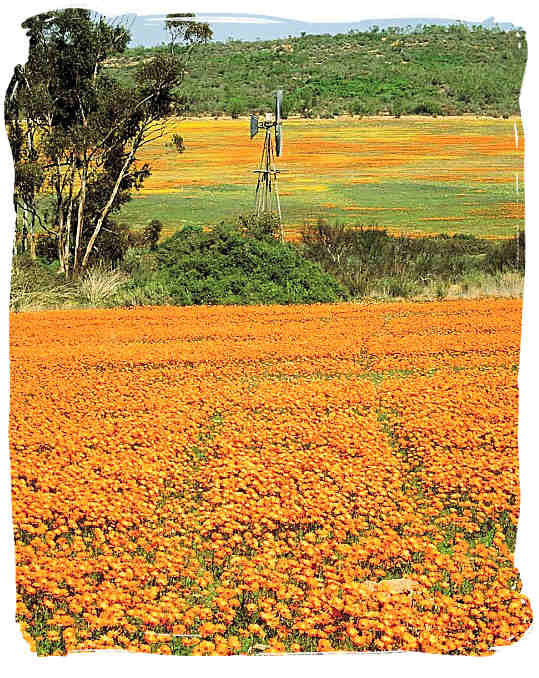 On the other hand, you can easily join a Namaqualand flower tour. Knowledgeable guides will be happy to present you with plenty of information regarding this unique multi-colored landscape. Visitors who enjoy the rough and tough type of travel experience, might well go for the option of traveling the 642 km Namaqua 4x4 route, that follows the Orange River to the Atlantic ocean. The Richtersveld National Park in Namaqualand's north-west corner, which is also well known for its Namaqualand desert flowers, also boasts the country's largest mountain desert, which stretches across the border into Namibia.